CTET Online Application July 2019 - All about the method of submission of online application form for Central Teacher Eligibility Test (CTET) for Paper I & Paper II Examination to be held on July 07, 2019. Candidates can apply for CTET-JULY 2019 ‘ON-LINE’ through CTET website www.ctet.nic.in. Candidates can apply ‘ON-LINE’ through CTET’s website www.ctet.nic.in. The candidate should supply all details while filling the Online Form and upload their scanned images of photograph & signature. After successful submission of data, Candidates are required to take printout of Confirmation Page for record and keep it for their reference. The Board has also announced the schedule of CTET for 2019 the 11th edition of CTET will be held ON 07.07.2019 (Sunday). ✓ The scanned images of photographs and signature should be in jpg format. ✓ Size of the photo image must be greater than 4 kb and less than 100 kb. ✓ Size of the signature image must be greater than 1 kb and less than 25 kb. ✓ Image Dimension of photograph should be 3.5 cm (width) × 4.5 cm (height) only. ✓ Image Dimension of signature should be 3.5 cm (length) × 1.5 cm (height) only. 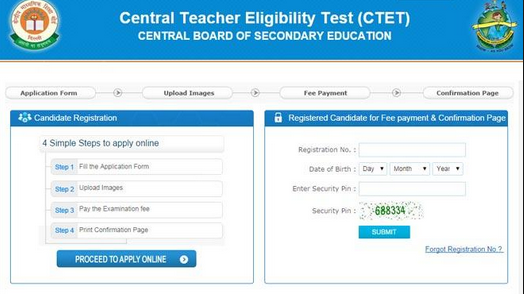 A candidate can apply for the Central Teacher Eligibility Test only On-line by logging on website www.ctet.nic.in. 2. Go to the link “Apply On-line” and open the same. (a)Fill in the on-line application form Part-I and note down the registration number. (c)Make payment of fee through Debit/Credit Card or download Challan for payment in the designated accounts of Syndicate Bank or Canara Bank. (d)Take the print out of Confirmation page for completing Part-IV and keep it for your future reference along with challan, (if fee paid through Challan mode). 4. Open the first link, follow the instructions carefully and submit the information. At the end of this page, two links “Next” and “Reset” are given. If you are satisfied that filled in information is correct then Click “Next” otherwise “Reset”. After opening “Next”, information submitted can be checked and if information is correct, go for “Final Submit” otherwise go for “Back”. 5. After Final Submission of data, programme will automatically take you to second link for uploading images of photograph and signature in JPG format only. 6. After Final Submission of data, programme will automatically take you to third link for payment of fees. 7. Follow the instructions and submit the fee. After successful submission of fee, programme will take you to fourth link to take print out of the Confirmation Page. 8. The candidates particulars entered can be edited till the payment of fees has not been made. The candidate’s particulars cannot be changed/edited once the examination fees have been submitted. Thereafter corrections in the particulars can be made during the period on-line corrections will be permitted from 14.03.2019 to 23.03.2019. 9. No change will be accepted through offline mode i.e. through fax/application or by email etc. No correspondence in this regard will be entertained. 10. All the four links for online submission of application form, uploading of images, payment of fee, updation of fees details and to take print out of confirmation page can also be used separately. We are advising to the candidates to keep in the touch regularly with the official website to know upcoming information like CTET Online Application/ Notification/ Exam Date 2019, CTET Correction Application Form July 2019 and CTET SEPT 2019 Answer Key/ Exam Result. Applicants can go through the official website www.ctet.nic.in to download their admit card and also know more information about the latest and upcoming notification. When will be the application online released for July 2014? Let me know the official announcement date for CTET July 2014. Looking for online application form link. If it is not then please let me know the date. ctet and htet should be held in july -august because our exam in july-august so please let me know the exam date. C tet qualified students agar sociology honours ho to kya vo kendriy vidyalay sangathan ka form nhi fill kr sakte h? Can i have details regarding latest ctet notification. CTET July 2015 application process has not started. Why are u provising misleasing info? Hi , I'm seeking complete information regarding CTET, if you can provide. online application is not possible since every time it says "security pin did not match". Can anybody please help with this error on the site? I am facing the same issue. This is the height of sloppy programming. They didn't even test the page properly before releasing it to students. KV pgt recruitment exam is there on 20/09/2015...how can we write ctet on the same date ? Sir when form will come for ctet? I've been trying to fill my ctet online application form for past few days, but it dint work because of some error in programming. how can i proceed with it before the dead line.please do the needful. select yes in the "Differently Abled Option". Fill your entire form after that and change it to "NO" in the end if it is your case. hi what is the educational qualification for computer science ???? sir humne ctet form successfully fill kar dya hu lekin final print me picture aa raha hi lekin signature nahi aa raha hi how to fix the issue. kindly suggest me sir. humne ctet ka form successfuly submit kar dya hi. final print me pic aa raha hi lekin signatue naha aa raha hi ho to fix the issue kindly suggest me. Can you please check and let me know why my money is not refunded in my account and nither showing payment done on CTET login. Payment deducted from my account and again there is option to pay your amount. I have done my payement to hdfc debit card , and 1000 rupees dedcuted from my account but once I login my form to print out it show pay your fee. I think somthing happen wroung sue to internet connection or browers refresh , So I could not print my form. Can you please check and give me solution . When my amount will be refunded or it should be show paid on my registration no? I have done payment on 20-12-2015 11:50:33 sec to New DElhi at CBSE53854 from hdfc master card and upto now I didn't find any feedback from CTET , even I have emailed the issues and tryting to call all numbers but no one is picking the phone and not replying the emails.